The InterContinental San Francisco has been awarded LEED Gold Certification under the U.S Green Building Council (USGBC) Leadership in Energy & Environmental Design for Existing Buildings: Operations & Maintenance (LEED EBOM), becoming the largest LEED Gold Recipient of existing buildings in California, and the 3rd largest in the United States. At InterContinental San Francisco, we are addressing our environmental challenges through technology, partnerships, and process improvements. We are dedicated to protecting our guests’ health and safety, our communities’ natural resources, and the global environment. 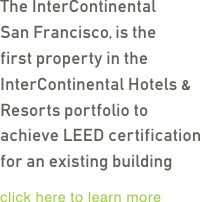 Working in conjunction with the USGBC (U.S. Green Building Council), the organization that sets the standards and categories for LEED® (Leadership in Energy & Environmental Design) certification, the InterContinental San Francisco is actively pursuing certification in the “existing build operations and maintenance” category (EBOM) and will be evaluated on every facet of the property from construction and design elements to the types of amenities used in hotel guestrooms. Since its debut, the hotel has committed itself to integrating as many sustainable practices as possible into daily operations and upkeep of the property, without undue impact on our guest's comfort. Becoming LEED® certified is an in depth process that looks at all aspects of our building and operations. Some of our current practices already meet LEED®’s strict credit s selection, and we are continually finding innovative solutions to achieve higher levels of compliance. There are many ways that the InterContinental San Francisco is already doing our part in conservation and being green, but we also understand that there is so much more that can be done, and are committed to improve and evolve towards even better business practices. We hope that you enjoy our green page and get to know us better through it. Please check back with us from time to time, as this is a site that will continue to grow and evolve. 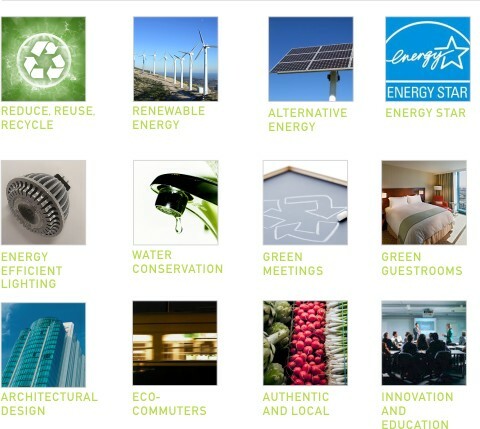 Click on any thumbnail below to learn more about some of our green initiatives.